Alexa Stewart drives for a lay-up. The Outlaws lost both their games last week: a 49-39 loss at home against Newport on Tuesday, January 29, and three days later they were defeated 54-26 at Cascade. The Outlaws started off slow in Tuesday's game against Newport, and at the close of the first quarter the Cubs had doubled them up at 16-8. Sisters had good ball movement in the second quarter and good looks at the basket, but just couldn't get their shots to fall. Many of their shots rattled around the rim, but sadly kept coming back out. Their only score came from Payden Petterson, who downed a three-pointer early in the period. At the half, the Outlaws were down 11-23. For the most part, Sisters was able to break the Cub's three-quarter press in the third quarter. Meaghan Greaney hit a couple of nice shots early in the period and Isabelle Spitler hit back-to-back three-ballers and a nice bucket to finish the period with eight of the Outlaws' 12-quarter points. It was a low-scoring fourth quarter, with the Cubs outscoring the Outlaws 8-7, and posting the win. Spitler led the squad with 14 points and Greaney followed with six. Sydney Head pulled down seven rebounds and Greaney recorded four. "I thought we really executed offensively our game plan that we'd been preparing for during practices," said Coach Brittaney Niebergall-Brown. "The girls are starting to gain a basketball IQ and are learning to work as a unit to accomplish a goal. We have noticed the girls being able to transition from different defenses and different offenses more smoothly and with everyone on the same page. I thought our ball movement and finding the open player was our best improvement in the game. We are also limiting our turnovers at the guard position, which is helping our offense move more smoothly. Three days later at Cascade, the Lady Outlaws played a tough game, but the Cougars' physicality and interior size outmatched the Outlaws size. The Cougars shot the ball well throughout the entire game, which they didn't do in game one when the Outlaws beat them at home in Sisters. The Outlaws only scored seven points in the first half, and were held to two points in the third period. As teams headed into the final quarter, the Outlaws were down 46-9. Sisters did a much better job in the fourth quarter, and the last five minutes of the game they really came together as a cohesive unit and played with confidence. Coach Niebergall-Brown told The Nugget they plan to build off those last five minutes as they head into another week of play. 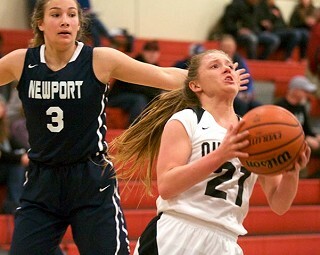 Kaylee Huber scored seven points for the Outlaws, Spitler had six, Bianchi recorded five, and Stewart added four. Niebergall-Brown said, "I thought we took good shots, but we just couldn't find the middle of the cylinder at times. Their energy and pressure forced us out of our comfort zone. I thought the girls did a good job executing our game plan, but we continue to work on progressing with our fundamental skills. We continue to show spurts of positive progression as we continue to challenge the girls to perform at a high level of play throughout the entire game." Sisters was to play at home against Woodburn on Tuesday, February 5. The Outlaws will play on the road at Philomath on Friday, February 8.